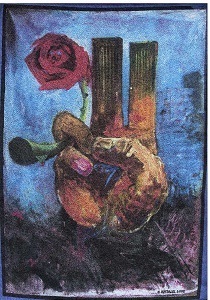 Janette MacKinlay, artist, author, activist, friend (See http://www.911blogger.com/node/22460), has been diagnosed, and will undergo extensive brain surgery on Friday, February 12, 2010. The surgery is scheduled to last four hours and Janette will have to be awake throughout the surgery, speaking, and being asked to move her limbs. Her ability to speak was impaired by the tumor and they anticipate that she will lose her ability to speak during the operation. The prognosis remains grim. She does appreciate all the thoughts, love, remedies, cures, directed her way. She is in the care of her two sons who are giving her devoted attention during this time of crisis. Many people have sent me suggestions for cures, remedies, and I haven't passed them all on. I did give her a copy of the recipe for herbs that helped my fiance many years ago. I must respect and support Janette's choice of treatment, especially since she is in the care of her family and the decision is a very personal one which most powerfully affects her and the people caring for her. All we can do is offer her our love and support. I do not attend church or believe in "organized religion," but I do believe in the power of focused intention, prayer, the psychic entanglement between all people in a larger field of consciousness. On a hike yesterday, my friend was telling me that Waldorf schools were successful because teachers took the time to focus their attention, meditate, heal their relationships with their students outside of the classroom... I've heard of scientific studies showing the healing power of thought or prayer upon individuals. I don't think it could hurt, if we, who know, love, care about, appreciate Janette send her our loving attention, healing thoughts, prayers, best wishes, particularly tomorrow during her surgery (probably between 11:30 am and 4:30 pm Pacific Time). Janette told me that she would be taking her new notecards with her to the hospital and looking at them and speaking about them during the surgery. They are beautiful and bring her much joy. Her ability to seek, find, and create beauty has helped her throughout the ordeal of her post-9/11 experience. She does believe that her exposure to the 9/11 toxic dust caused her tumor. Last year, Bill and I attended a Teachers 4 Social Justice Conference, where we tabled 9/11 truth materials, and I attended a keynote speech centered around a poem which included a line about "roses growing in concrete," marvelling that they could grow at all, and remarking on their incredible beauty, despite the scars they bore. None of us are perfect without blemishes of some sort. I see Janette as a beautiful rose, blossoming in the rubble of the World Trade Center towers, an extraordinary gift to all of us, sharing her wisdom, insight, creativity, joy, pain, anger, courage, connecting east with west, victims, first responders, family members, researchers, activists, and artists. Her honesty, openness, generosity, kindness, energy strengthened all of us. I believe that Janette's loss is our loss. It is so hard to bear the thought of losing her. I do hope others will join me in evoking that mysterious power which grants life or death to aid us in healing Janette, so that we won't be deprived of her. I know that Nelson Mandela, and prisoners sometimes showered whatever living thing, even prison guards who entered their cells with love, to sustain their own spirit and to survive. Janette has that enormous capacity to find beauty and joy in nature, particularly flowers. So, tomorrow, I suggest that we each give some attention to at least one flower, notice its beauty and the delight you feel towards living things. Send that joy, love, and your best wishes to Janette, hold her in your heart. Life is a miracle. Savor and appreciate the moment and sharing this journey with Janette and so many other wonderful, courageous spirits. Allow that love to spill over to all those affected by the dust, and all those in the larger expanding circle who have been harmed by the wars, the surveillance state, the injustices caused by misplaced fears. We might lose Janette, but if anything will heal and save humanity, it is our individual and collective love of life, outweighing and overcoming fear and pain. To some extent, we are all roses trying to grow despite the concrete which envelopes us. Janette's website and book are at- http://www.theneedtoremember.com. "Her ability to seek, find, and create beauty has helped her throughout the ordeal of her post-9/11 experience." If the whole country responded to 9/11 the way Janette did, we'd all be in paradise by now. Thank you, Carol, for putting it all together for us. There is something everyone relates to in what you wrote. And we are all praying in our own way. 911Peacenik on Thu, 02/11/2010 - 11:40pm. Thank you for the message you posted! I'm not sure your schedule, or my condition is receiving for visitors but you are welcome. I hope I will be by Sunday. Carol Brouillet on Thu, 02/11/2010 - 11:54pm. Thanks Carol. Janette is a hero beyond heroes because she employs the active ingredient of love. John_Parulis on Fri, 02/12/2010 - 1:21am. I'll be saying a prayer for our friend Janette. In the last few years she's been a light in the darkness. Kevin Ryan on Fri, 02/12/2010 - 8:16am. jonathan mark on Fri, 02/12/2010 - 10:53am. Brain surgery, that is awful. I am praying for you Janette. I love you bunches. God willing you will pull through just fine. The whole truth movement is pulling for you. 9-11 Joe on Fri, 02/12/2010 - 2:45pm. I just returned from the hospital. Janette's surgery lasted 6 hours. It wasn't easy for her to talk, move and stay conscious all that time, but she did feel that the operation went well, miraculously well. It was wonderful to see her, and to see her smile and speak with ease. They were very much afraid that she would lose more of her capacity to talk. She did feel the love and energy pouring her way and is very grateful for all the loving attention that she has received from her family and from others. It's not too fun being in the hospital. She is in a semi-reclining position, almost sitting up. The lights in her room are on and the nurse comes in to check her every hour, waking her up. She has a very mild headache, but seems to be in very good spirits and quite philosophical about accepting the abrupt course change in her life. Images of her new grandson, her beautiful flower arrangements bring her much happiness. She is also very glad about the news of New Hampshire's push for a new 9/11 investigation. She is still very much with us, so keep sending her love and healing energy. Carol Brouillet on Sat, 02/13/2010 - 12:42am. I was wondering what hospital she is in. I would love to visit her and bring her some flowers unless they have released her already. 9-11 Joe on Sat, 02/13/2010 - 9:10am.